I loved this story as it was written with such suspense, it was nail biting. You don’t know who to trust, what to believe, or where this story is going to go next. There is no second guessing what’s going to happen or what will happen next in this story. Nora and Brendan lived in the small town of Wedeskyull, New York, in the northern Adirondack Mountains. All you saw were walls and sheets of snow carved out from the ground up, snow flying all the time, and continuously the same color up to the sky – grey. Winters here were especially brutal. One could easily freeze to death if not careful. Brendan, Nora’s husband, grew up here, so Nora was the Newcomer. Brendan ended up becoming a police officer, like his father. About twenty-five years ago, Brendan lost his two-year old brother in a terrible accident in which he fell through the ice, and Brandan had always blamed himself for that. Nora never knew or completely understood all of the details about. He kept this to himself pretty much, and he did not discuss it, just enough that she knew about it. She felt he blamed himself completely for the accident, which he shouldn’t have as he was just a kid when it happened. One morning Nora wakes up late and groggy-headed, which was odd for her. They had such a beautiful evening together the night before, so much so after they were finished making love, they snuggled a lot longer than what they normally did. It was really nice and she smiles remembering it. She had to hurry as she had to meet with a client that morning as she restored old houses, and now she’s off to a late start. This is unlike Brendan not to wake her. She went through the house looking for Brendan and she finds he hung himself to death from the rafters in their farmhouse basement. This is odd. He’s a police officer by trade who has a gun. Why suffer from hanging yourself when you could end it quicker and painlessly with a shot to the head? This occurrence had me wondering about that. Later in this story she finds the rope he used to commit his suicide with was the same rope he used over twenty some years ago to try to help save his little brother from drowning, to no avail. His suicide is just about on the anniversary of his little brother’s death, too. This is so wrong, she thinks to herself. Nothing is making any sense to her. This starts her on a quest of her own investigation to find out why he would do such a thing. She hires a private investigator to help her find out what happened. This did not fit her husband’s personality at all. Brendan was not the type of person to commit suicide, yet she starts to wonder because she also finds a prescription bottle filled the week before, on January 16th, and it was a sedative. He never told her about that. When she takes the bottle to the pharmacy to ask questions about it, it was confiscated by the local pharmacist so quickly she didn’t know the bottle would not be returned to her. All she had were questions, but once he had it, it was his. It had a red mark on the bottle though, one she would come across again, later. The problem: "who" can and can't she trust? Who will and who won’t give her information? Wedeskyull was a very secretive, cliquey type small town. She felt like an outsider here, even with her own mother-in-law who just seemed to ignore her. The state-of-the-art police force, which was odd for such a small town, all grew up together, and they try all they can to keep her quiet and not asking questions. Even they seemed to be corrupt. Family? Friends? No. Nora is on her own trying to figure out this one. Can Nora figure out all the deep secrets of 'why' her own husband seemed happy and loving the night before, yet at the same time drugged her, and then committed suicide? She learns her own husband has secrets, too? The town has secrets, her mother-in-law has secrets, the people have secrets, so why all the secrets? This book’s writing was outstanding! I LOVED it with all the twists, turns and danger Nora gets herself into, some intentionally and some not. This was one heck of a greatly written beyond suspenseful mystery where you never knew what was going to happen next, and there is plenty of action that continues as Nora tries to figure out just what really happened. I really enjoyed reading this book in the dead of winter as the wind whipped around outside quite severely, the snow fell, and it is freezing outside! I felt like I was right in the story. 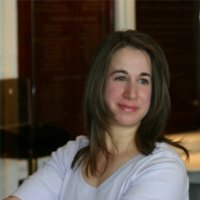 Jenny Milchman lives in New Jersey with her family. Cover of Snow is her first novel. Awesome! Thanks for sharing this book! I am always on the lookout for a new and fantastic reading adventure. I'm leaving a second message to you because I don't know that you got the first? I don't know if I hit REPLY or started a NEW Comment! LOL! The Author, +Jenny Milchman, stopped by here and left you a little message, too! You are very welcome! I LOVE sharing GREAT books! 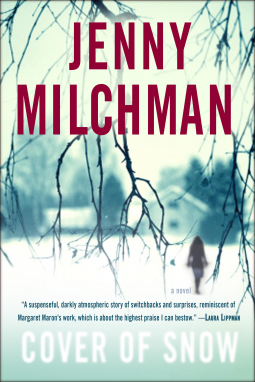 This one, "Cover of Snow" by +Jenny Milchman was SO full of suspense, WOW! I've read some good suspense books, but this one, every page! Yes, Cover of Snow has been the BEST, lately, by far! Hope you enjoy it as much as I did! Thanks SO much for leaving a comment, too! Laurie, thank you so much for reading my book, and for feeling this way about it. You probably know how much such a close read means to a first time author. I am very grateful. Small Book Blogger, i really appreciate your finding Laurie's review! She is everywhere, so not so hard to find :) But I appreciate your being interested in my book! I'm SO glad you stopped by! Sorry I didn't see this message until now, but I'm SO excited you stopped by!!! I LOVED your book! I really did feel like I was right there in the middle of the story while reading it, along with the weather here, too! It fit right in! GREAT timing of the release! The story was SO suspenseful! You really didn't know 'who' to trust! Even at the end . . . Wow! Congratulations for this book!!! A LOT of hard work went into it, I know! It was well-worth the read! Honestly, I have to admit, I read another book that took place in the Adirondacks that took place during Winter, as well, and I CANNOT NOW remember 'that' book at all, but YOUR book I remember detail by detail! Your writing is INCREDIBLY wonderful! Yes, I know how much this means to you. You are a wonderful person who is SO kind, nice, GREAT to talk to, and I feel like I've known you forever! Thank you for stopping by the blog and leaving a comment! Thank you for the compliment, too! PS. Yeah, I guess I 'do' get around!!! LOL!!! Thanks again for coming by! This was a truly GREA surprise to come across and see you here! Keep writing, PLEASE! I'm ready for your NEXT book!